Incredibly, the official classification of Bordeaux in 1855 was not only the most famous wine classification in the world, but has remained so for more than 160 years. Napoleon III, instructed the French Chamber of Commerce and Industry to select and classify the best French wines, which were to be presented at the Paris exhibition in 1855. The wines were ranked according to reputation and value, which presumably matched the quality. This is how Classification officielle des vins de Bordeaux de 1855 appeared — a document that defines the quality levels and importance of wineries for the French economy. The wines in the final list received categories, the so-called Cru, from first to fifth. Almost all the red wines in the classification came from the Medoc region, with the exception of the Château Haut-Brion wine, which came from the commune of the Graves region. In each category, wineries were located in accordance with the quality indicators of their products. Fortunately, by that time Bordeaux wines already had a 200-year history. Even if someone produced stellar wine in 1854, this did not at all ensure its entry into the classification — without substantial accumulated history there would not be the slightest chance. Otherwise, such a classification would have been forgotten the very next year. For all the time of existence, the classification has undergone two changes. The first is purely technical: in 1856, Château Cantemerle was penciled in the list as the 5th Growth. The second is significant and caused a lot of noise: in 1973, Château Mouton Rothschild was transferred from the second to the first Growth category after more than half a century of lobbying by the tireless genius owner of the estate, Baron Philippe de Rothschild. The first attempt to classify Bordeaux wines was made in 1647, when market prices of wines produced in different communes of the region were recorded. By the end of the 17th century, several first-class estates were formed in the communes of Pessac, Margaux and Pauillac — Haut-Brion, Margaux, Lafite and Latour, respectively. The first wine brokers called them “First Growth”. During the 18th century, especially due to the constant noise from the British about the need to improve quality, several more estates appeared next to the original “first growths”, whose wines were recognized and their prices reached substantial levels, though slightly lower than the first. These wines were called “second growth”. With the continued demand for quality wines, a number of manufacturers made efforts and over time their wines also rose in price. Thus, in the records of wine brokers formed the following classes — the third, fourth and fifth, which corresponded to the level of market prices. By 1855 there were many classifications, but none of them was of a permanent nature. The positions of producers varied depending on how well their wines were sold. 1855 could be another temporary classification, but those who missed that chance regret it for more than 160 years. There have been and are continuing attempts to make changes to the 1855 classification. First of all, the idea to include other areas of Bordeaux. Why, with the exception of Graves Haut-Brion, were only Medoc red wines considered? In fact, because the prices of the other red wines from Graves to the south of Bordeaux were not comparable in price to the wines of Medoc. A so-called “Right Bank” wines from St-Emilion and Pomerol, were not served by brokers in Bordeaux. Those wines had a different trading scheme used in the port of Libourne, from where the wines were shipped mainly to the market of Holland and not Britain. And in those days, this market was more focused on quantity rather than the quality of wines. That is why none of these wines, some of which are today considered among the most expensive wines in the world, were even offered for consideration in the classification. Once the term “Super Second” appeared. Most likely it was coined by negociants who sell Bordeaux wines. Super Seconds were called wines which didn’t belong to the First Growths, but which quality, reputation and sometimes even the price was comparable to the first growths. There is no generally accepted list, but there are a few that most often fall into this special category. Some skeptics periodically raise the question, and whether the quality of some “first” ones has fallen, that they no longer correspond to their high status. Maybe it would be fair for them to give up their status more worthy? There is an alternative classification proposed by the London International Vintners Exchange (Liv-ex), which is based on market prices. Indeed, a huge number of deals are made on this marketplace and wine quotes largely reflect the actual market value. Another question is whether the quality and reputation of wines adequately reflects the market price? In my opinion — not quite and only partly. There are speculative strategies which exist in the market, different volume of supply and other factors that significantly influence the price. The famous wine critic and wine connoisseur of Bordeaux Robert Parker divided Châteaux into several categories according to his own preferences based on his unique tasting experience. At different times, other critics and wine journalists offered their lists and categories. In the recent history, numerous user ratings have appeared that reflect the preferences of a large number of non-professional consumers. Such ratings cause skepticism from the professional community, but at the same time correlate well with the ratings of leading critics. I wanted to understand this uncertainty and create a single weighted current rating of Left Bank Bordeaux estates. I deliberately refused the price factor and summarized the ratings of professional critics and wine journalists, along with user ratings. As a result, I had to analyze more than 18 thousand professional assessments and more than 80 thousand user evaluations of all classified estates from 1982 to 2017. The expert opinions of Bordeaux connoisseurs are taken into account in thematic forums and communities in the USA, Great Britain and Europe. In this large-scale study, many factors were taken into account in order to achieve maximum objectivity and balanced results. study revealed a number of very clear trends that leave no doubt in the validity of the final rating. It should be noted separately as the quality of wines has significantly increased over the past 20 years. This trend can be clearly seen in the absolute values ​​of the ratings of professionals and amateurs. One can argue about the causes (global warming, technological progress, etc. ), but the fact cannot be denied. 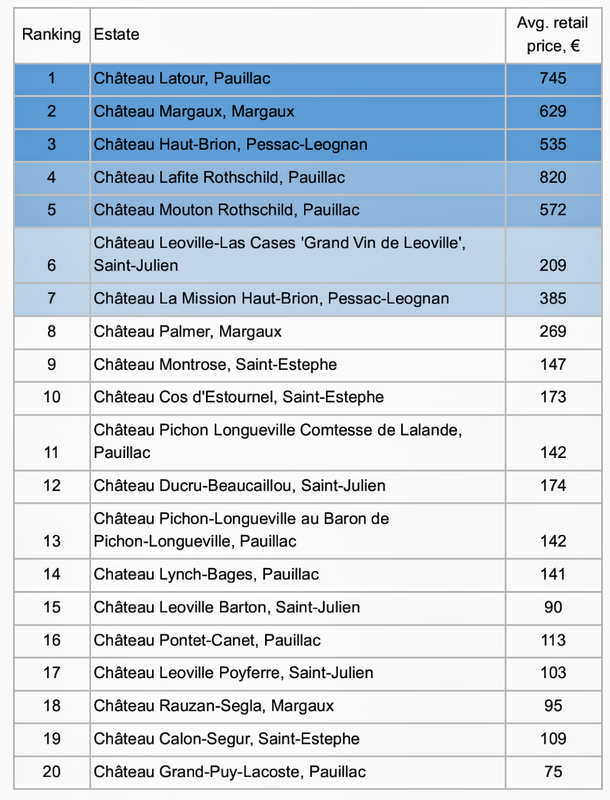 Chateau Latour, Pauillac — is the absolute leader of the rating. This wine has received the highest ratings of both professionals and consumers. Latour was recognized as the best wine of the year in Bordeaux, the maximum number of times from 1982 to 2017. Throughout all these years, the wine has consistently been among the top five, regardless of the characteristics of each particular vintage. Together with the two closest competitors Chateau Margaux, Margaux and Chateau Haut-Brion, Pessac-Leognan, they form the Super League among Premier Cru Classe. Both Rothschilds (Mouton and Lafite) significantly lag behind in the results of the first three. Chateau Margaux and Chateau Haut-Brion are much closer to the leader and to each other. They went into the lead over the Rothschilds. A similar situation is observed among the Second Grwoths. Chateau Leoville-Las Cases ‘Grand Vin de Leoville’, Saint-Julien and Chateau La Mission Haut-Brion, Pessac-Leognan (not included in the original classification of 1855) in large separation from the rest of the castles. The next 12 estates significantly lag behind the first 7. At this lag is not so significant. The reputation and quality of Chateau Palmer, Margaux, Chateau Montrose, Saint-Estephe and Chateau Cos d’Estournel, Saint-Estephe are very close, but the data make it possible to rank out of them. The reputation of Chateau Ducru-Beaucaillou, Saint-Julien was negatively influenced by a series of failed vintages in the late 80s, but we must pay tribute to the winemakers for the incredible efforts that were made to correct the situation and improve quality. This is especially noticeable since the 2000s. Another example of a tangible leap in quality is Pichon Baron. Here it is clearly seen how the quality level progresses from the early 2000s. Undoubtedly, this is directly connected with the arrival of Christian Seely, who once at that time headed the Chateau and took a number of radical measures aimed at increasing the quality of winemaking. The champion among the explosive growth of quality is certainly Chateau Pontet-Canet, Pauillac. The tireless work on quality, the transition to biodynamics (from 2011 fully certified) apparently gave their results. By the way, it is worth highlighting Chateau Palmer, which also switched to biodynamics (started in 2011 and certified from 2017) and the quality growth of wines over the past 2 decades. The transition to more responsible farming is becoming a steady trend. For example, the leader of the rating Chateau Latour is certified organic. Curiously, but the fact that the growth dynamics of the quality of Latour wines correlates with their transition to organic. It is fair to note the success of Chateau Lynch-Bages, Pauillac, which formally belong to the 5th growth, but over the past 4 decades consistently demonstrate the high quality of their wines and deservedly occupy a high position in the ratings, which fully reflects the popularity among consumers and the appreciation of critics. As can be seen from the table, prices do not reflect the balance of power in the rating at all. Lafite and Mouton are significantly overvalued, and Las Cases are obviously undervalued. Continue the study of the dynamics of market prices and en primeur, as well as to form an appropriate weighted rating of winemakers of the right bank based on the same methodology. It might be interesting to look at the generalized wine rating of both banks and compare the wines with each other. All wines in the sample have a rating of at least 3 professional critics and 25 users (provided by cellartracker.com) for each individual vintage. If the critic evaluated the wine several times, then the preference was given to the latter (fresh). Different critics may have different scales for assessing wine. And even when they use the same scale, they also have different habits and tastes. The algorithm applied (The Global Wine Score) takes into account the differences of critics’ estimates and the different scales used by normalizing the input data to achieve the most fair estimate. In addition, key statistical indicators (average values, 10% and 90% quantiles) of the distribution of critics’ ratings were checked. The results showed greater consistency between critics’ ratings and the estimates used in the study. In case of partial or full publication of research results, reference to the original source is obligatory. Copyrights belong to Stas Medvedev (WineTalks.club), author of the research. Stas Medvedev - passionate wine enthusiast. The founder of the wine club. We taste and talk about wines. We explore wines, learn and share with each other.